Ten years ago, college student Quincy Carpenter went on vacation with five friends and came back alone, the only survivor of a horror movie–scale massacre. 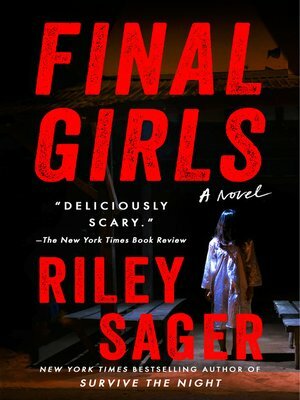 In an instant, she became a member of a club no one wants to belong to—a group of similar survivors known in the press as the Final Girls. Lisa, who lost nine sorority sisters to a college dropout's knife; Sam, who went up against the Sack Man during her shift at the Nightlight Inn; and now Quincy, who ran bleeding through the woods to escape Pine Cottage and the man she refers to only as Him. The three girls are all attempting to put their nightmares behind them and, with that, one another. Despite the media's attempts, they never meet. Now, Quincy is doing well—maybe even great, thanks to her Xanax prescription. She has a caring almost-fiancé, Jeff; a popular baking blog; a beautiful apartment; and a therapeutic presence in Coop, the police officer who saved her life all those years ago. Her memory won't even allow her to recall the events of that night; the past is in the past.